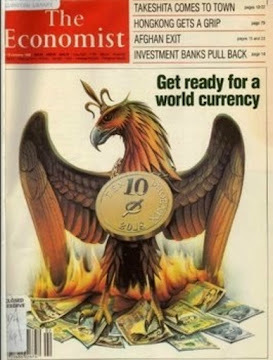 In 1988, The Economist ran an article titled, Get Ready for the Phoenix, in which they wrote. THIRTY years from now, Americans, Japanese, Europeans, and people in many other rich countries, and some relatively poor ones will probably be paying for their shopping with the same currency. Prices will be quoted not in dollars, yen or D-marks but in, let's say, the phoenix. The phoenix will be favoured by companies and shoppers because it will be more convenient than today's national currencies, which by then will seem a quaint cause of much disruption to economic life in the last twentieth century. At the beginning of 1988 this appears an outlandish prediction. Proposals for eventual monetary union proliferated five and ten years ago, but they hardly envisaged the setbacks of 1987. The governments of the big economies tried to move an inch or two towards a more managed system of exchange rates - a logical preliminary, it might seem, to radical monetary reform. For lack of co-operation in their underlying economic policies they bungled it horribly, and provoked the rise in interest rates that brought on the stock market crash of October. These events have chastened exchange-rate reformers. The market crash taught them that the pretence of policy co-operation can be worse than nothing, and that until real co-operation is feasible (i.e., until governments surrender some economic sovereignty) further attempts to peg currencies will flounder. But in spite of all the trouble governments have in reaching and (harder still) sticking to international agreements about macroeconomic policy, the conviction is growing that exchange rates cannot be left to themselves. Remember that the Louvre accord and its predecessor, the Plaza agreement of September 1985, were emergency measures to deal with a crisis of currency instability. Between 1983 and 1985 the dollar rose by 34% against the currencies of America's trading partners; since then it has fallen by 42%. Such changes have skewed the pattern of international comparative advantage more drastically in four years than underlying economic forces might do in a whole generation. In the past few days the world's main central banks, fearing another dollar collapse, have again jointly intervened in the currency markets. Market-loving ministers such as Britain's Mr. Nigel Lawson have been converted to the cause of exchange-rate stability. Japanese officials take seriously he idea of EMS-like schemes for the main industrial economies. Regardless of the Louvre's embarrassing failure, the conviction remains that something must be done about exchange rates. Something will be, almost certainly in the course of 1988. And not long after the next currency agreement is signed it will go the same way as the last one. It will collapse. Governments are far from ready to subordinate their domestic objectives to the goal of international stability. Several more big exchange-rate upsets, a few more stockmarket crashes and probably a slump or two will be needed before politicians are willing to face squarely up to that choice. This points to a muddled sequence of emergency followed by a patch-up followed by emergency, stretching out far beyond 2018 - except for two things. As time passes, the damage caused by currency instability is gradually going to mount; and the very tends that will make it mount are making the utopia of monetary union feasible. The biggest change in the world economy since the early 1970's is that flows of money have replaced trade in goods as the force that drives exchange rates. as a result of the relentless integration of the world's financial markets, differences in national economic policies can disturb interest rates (or expectations of future interest rates) only slightly, yet still call forth huge transfers of financial assets from one country to another. These transfers swamp the flow of trade revenues in their effect on the demand and supply for different currencies, and hence in their effect on exchange rates. As telecommunications technology continues to advance, these transactions will be cheaper and faster still. With unco-ordinated economic policies, currencies can get only more volatile. Alongside that trend is another - of ever-expanding opportunities for international trade. This too is the gift of advancing technology. Falling transport costs will make it easier for countries thousands of miles apart to compete in each others' markets. The law of one price (that a good should cost the same everywhere, once prices are converted into a single currency) will increasingly assert itself. Politicians permitting, national economies will follow their financial markets - becoming ever more open to the outside world. This will apply to labour as much as to goods, partly thorough migration but also through technology's ability to separate the worker form the point at which he delivers his labour. Indian computer operators will be processing New Yorkers' paychecks. In all these ways national economic boundaries are slowly dissolving. As the trend continues, the appeal of a currency union across at least the main industrial countries will seem irresistible to everybody except foreign-exchange traders and governments. In the phoenix zone, economic adjustment to shifts in relative prices would happen smoothly and automatically, rather as it does today between different regions within large economies. The absence of all currency risk would spur trade, investment and employment. The phoenix zone would impose tight constraints on national governments. There would be no such thing, for instance, as a national monetary policy. 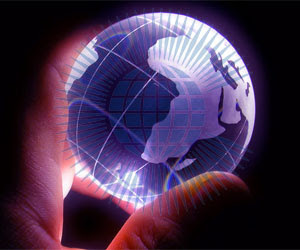 The world phoenix supply would be fixed by a new central bank, descended perhaps from the IMF. The world inflation rate - and hence, within narrow margins, each national inflation rate- would be in its charge. Each country could use taxes and public spending to offset temporary falls in demand, but it would have to borrow rather than print money to finance its budget deficit. With no recourse to the inflation tax, governments and their creditors would be forced to judge their borrowing and lending plans more carefully than they do today. This means a big loss of economic sovereignty, but the trends that make the phoenix so appealing are taking that sovereignty away in any case. Even in a world of more-or-less floating exchange rates, individual governments have seen their policy independence checked by an unfriendly outside world. The alternative - to preserve policymaking autonomy- would involve a new proliferation of truly draconian controls on trade and capital flows. This course offers governments a splendid time. They could manage exchange-rate movements, deploy monetary and fiscal policy without inhibition, and tackle the resulting bursts of inflation with prices and incomes polices. It is a growth-crippling prospect. Pencil in the phoenix for around 2018, and welcome it when it comes.